My last blog post received comments wondering if I excused the Charlie Hebdo massacre. Of course I don’t, I’m just very worried with an increasing polarization worldwide. I think the massacre was horrifying. I have been deeply saddened and upset by the video of Ahmed Marabet raising his hands to the killers to show he’s giving up and them answering with shooting him in the head. I could hardly believe the details from the first massacre and it took time before I could read all the details from it. My stomach turned when I knew about the four innocent people killed in the kosher shop. I don’t justify any killings of anyone, I believe you can be a dictator, mass murderer or cartoonist drawing stereotypical images of minorities, and still no one has the right to kill you. I also think that the police should have made more efforts to arrest the Kouachi brothers alive together with Coulibaly, so that they would have been held accountable for their disgusting crimes and spend the rest of their lives in prison. Getting away with death was too easy on them. But that doesn’t mean I will agree on the cartoons that Charlie Hebdo published. And republishing them in masses of newspapers in response to the massacres, or using the hashtag #killallmuslims, will probably push more young, angry and confused people into the welcoming arms of extremists. I asked in the last blog post, written just right after the killings, if the murderers were confused young Muslim immigrant men, and they turned out to be – with the interesting addition that they were orphans. It doesn’t surprise me the slightest. I’ve known plenty of young angry men, and they are never from happy circumstances. If they were, they wouldn’t be so angry. What else is, there’s many of them and they will easily be affected by the increased polarization. Also me I condemn the Charlie Hebdo massacre, but I won’t glorify the cartoons. They were striking towards already exposed minorities. That wasn’t the sole reason for the massacre, but nothing good comes out of it. Just curious, what are your thoughts on the Nigerian massacre of over 2000 Nigerians by Boko Haram, AFTER the killing of 12 French Charlie Hebdo employees? Have you even heard of that Nigerian massacre…..cause AmeriKKKan media thought the massacre of 2000 mostly kids & women, much less important than 12 French causalities. Of course I have, I have been working in Africa and am well aware of Boko Haram. I think that massacre is horrible and I wonder why the world don’t pay more attention to that. But that is usually the case when a massacre takes place in a less developed country where people don’t have a voice in the international community. That means in an African country where those massacred are Black Like Me. Namaste. Yes the international scale of how much people’s lives are worth according to their colour, ethnicity and religion seems quite static. Very well said. Tubularsock feels you have expressed it perfectly. Poking someone in the eye with a stick usually doesn’t bring about a peaceful resolution. But in this case both sides were running their hatreds. Extremists are just that no matter where they come from and the results are always what you reap you sow. 🙂 Are you in Pakistan at the moment? Je suis désolée! Vous n’avez pas à faire l’amalgame entre ces deux communautés l’une nigeriane et l’autre française! Ces assassinats sont aussi horribles l’un comme l’autre!vous trouvez des excuses à ces gens qui n’ont qu’un but ,terroriser et mettre à genoux des personnes qui pensent différemment qu’eux!je vis en France! Par pitié ne les encouragez pas en leur trouvant des excuses!aujoud’hui c’est la France et le Nigeria ‘demain ce sera peut être votre pays où un autre! Pas d’excuses, mais je n’aime pas le racisme dans les caricatures. There are no words ….. this it too common in our world now. Polarization indeed! SMH …. J’ai très bien compris le poste! Concernant les caricatures?que faites vous de la liberté d’expression? C’était moi qui ne pas compris votre commentaire, j’ai changé ma réponse. Vladimir Jankelevitch says “Humor is smile of intelligence”. Besides, there is no equality about the freedom of speech between in the people classes on this planet. And, besides, I could write these in my native language, but most people wouldn’t have understood; and I am respect of their freedom of understanding what they read in common social platform. As I am not an expert on French politics, nor do I even read French having forgotten what I knew as a kid, I am not in a position to make a definitive judgment. 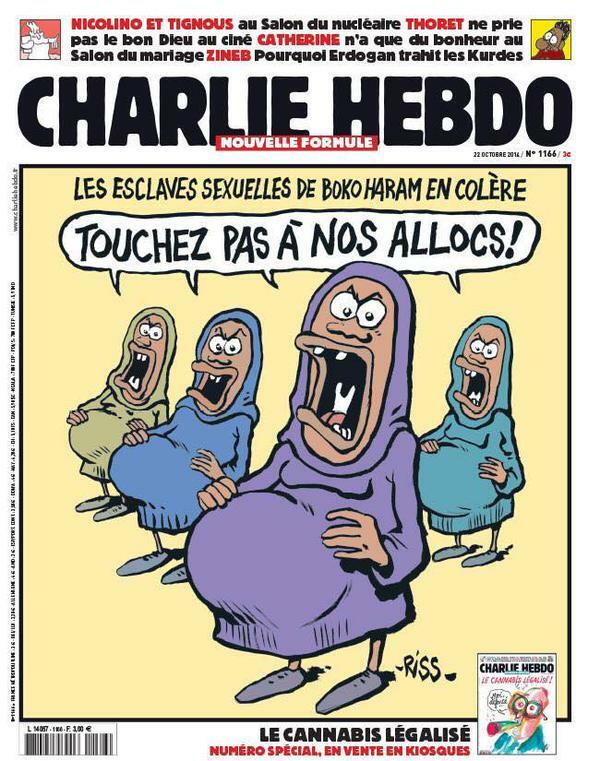 But other readers might find the web site (http://www.understandingcharliehebdo.com/) interesting, as I did, for providing details on the subtleties of some of the cartoons. But, having said that, I do continue to believe we should make a distinction between the right to be offensive, and whether we should be offensive. As someone who has written many satirical poems, intentionally poking people in the eye for the sake of poking them in the eye really isn’t what “satire” ought to be. Pappy and I agree with the comments you and your followers have made above. We would only comment on the reasons for the divergent attention of the media, particularly in our good old U.SofA. Unfortunately, the majority of our populace have extremely short attention spans these days, and the media, of course, get paid for getting them to watch the advertisements. The quick, very photographic murders such as at Charlie Hebdo suit the medias’ needs for attracting viewers and then redirecting them to their sales pitches. Ongoing atrocities as carried out by Boko Haram are too far off to get good photographic coverage and are so far removed that they don’t make for good television news. Only one of the reasons why we continually urge our comrades to abandon their tellys! Reblogged this on Buster's Two Cents. The US/NATO powers have demonstrated repeatedly and unequivocally that when provoked, they will react swiftly and with disproportionate force. There is a difference between a tragedy and a genocide. Thank you for the stands you make, JC. Thanks for the link Jeff! “There is a difference between a tragedy and genocide” – you perfectly nailed it down.